Keller, Tim. Making Sense of God: An Invitation to the Skeptical. New York: Viking, 2016. 254 pages. $17.70. Tim Keller has served as the founding pastor of Redeemer Presbyterian Church in Manhattan for nearly thirty years and has spent much of his ministry engaging skeptics of Christianity with both winsome humility and intellectual dexterity. Making Sense of God, which serves as an apologetic prequel to his previous book, The Reason for God, exudes the same charitable tone and rhetorical skill that those familiar with Keller’s work and ministry have come to expect. The book is a prequel in that Keller aims to present Christianity as desirable first, whereas in The Reason for God, he aims to present Christianity as rational. His basic supposition is that before a person will consider seriously whether Christianity is true, she must first want it to be true. Keller essentially argues for two broad theses. He argues in the first section of the book that “every person embraces his or her worldview for a variety of rational, emotional, cultural, and social factors” (pp. 4-5). And, he argues in the final two sections of the book that Christianity makes the most emotional, cultural, and rational sense while also supplying the resources for meeting life’s needs in a way far superior to secularism. Setting out to sustain his first thesis, Keller cites a major study conducted by the Pew Research Center that concluded that religion is on the rise whereas secularism is on a steady decline. The reason for this, he argues, is two-fold. First, secularism leaves out some crucial things necessary to living well. Second, many people sense intuitively that something exists that is beyond the natural world. He defends these claims well and with an impressive breadth of research. Though one might raise the question of how much of naturalism—embedded tacitly and so firmly in the modern conscious and reflected in the patterns, rhythms, and forms of culture—is unknowingly lapped up by these growing religions such that while much of their verbal content is “religious,” much of their formal content is thoroughly naturalistic. He further sustains his first thesis by demonstrating that both belief in God and non-belief are based on a combination of faith and reason. He leans heavily on Michael Polanyi’s as well as Friedrich Nietzsche’s work for support. Polanyi argued that all knowledge is subjective in that it is known by subjects who all hold certain beliefs based on tacit knowledge, that is, knowledge that has not been rationally evaluated. Nietzsche argued that once God is taken out of the picture, all objective truth, values, and meaning go with Him. The secularist has claimed often that his beliefs are based on reason whereas the religious person’s beliefs are based on faith. It is this claim that Keller masterfully takes apart in the first section. 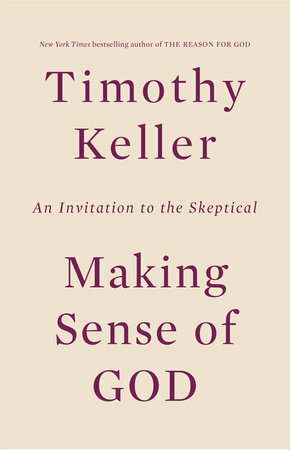 In the second and third sections, Keller moves to argue that Christianity delivers stable meaning that can endure suffering, deep satisfaction that is independent of life’s circumstances, freedom that avoids the naively thin modern conception of only freedom from constraints, a sense of self/identity that at the same time produces joyful self-affirmation and humble self-denial for the good of others, hope that can stare death in the face through the promise that paradise lost will one day become paradise restored, a grounded morality that can make sense of the moral feelings that all people experience, and justified support for human rights and compassion toward the oppressed. Keller evaluates all of these goods that most people in the modern Western culture would affirm as good, and shows how Christianity makes by far the most sense of human experience and lends the best tools for dealing with the unavoidable problems of life. Major influences on his work in these sections are Robert Bellah and Charles Taylor. He concludes his book with two short chapters on some familiar rational arguments for Christianity. He briefly presents the cosmological argument, the teleological argument, the moral argument, the argument from consciousness, the argument from the trustworthiness of one’s rational faculties, and the argument from beauty. C. S. Lewis formerly argued that materialism cannot account for one trusting one’s rational faculties, and Alvin Plantinga expanded on this argument giving it a more philosophically robust treatment in more recent days. This argument has generated a great deal of discussion recently, so Keller’s inclusion of it is pertinent. His final arguments make a case for Jesus being who He claimed to be. He defends the credibility of the Scriptures, Jesus’ character and wisdom, His claims of divinity, and the evidence for His resurrection. Significant weaknesses are hard to find given that Keller sets his arguments up with great care as he avoids claiming more than he can demonstrate reasonably. The intuitive force of his arguments is also hard to ignore. One minor pushback would be that he writes throughout of “values” rather than of “virtue.” This change in language over history is not insignificant given that the move to speak of “values” conveys a move away from universals and toward particulars. To be fair, he does write of “universal values,” so the idea of universals might be present, but in a post-Enlightenment age that brought on its heels the loss of the universal, and consequently the turn from virtue to values, it would have been a welcome lingual corrective to write of virtue. Virtue will be virtue whether people value it or not. The strengths of Keller’s book are several. He presents a breadth and depth of quality sociological and philosophical research, making his arguments clear, well-supported, and fairly easily accessible to the thinking person. The inquisitive skeptic will find Keller’s tone charitable and his approach inviting. It is as if Keller is saying to the skeptic, “Let’s consider our common experiences of life and the things we most value. Now, would not this story, if it were true, explain these experiences and values very well? Would it not seem to grant you the things you most desire in life in a logically consistent and emotionally and culturally relevant way?” Keller’s strategy is brilliantly perceptive of the modern secular mindset, in that he is not arguing for the truth of Christianity up front, but rather the beauty of it. His aim is to present Christianity in a desirable light so that the secular person will want to explore the rationality and truth claims of Christianity. 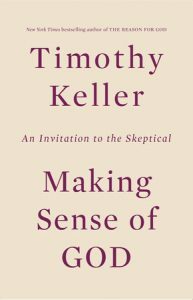 Keller has produced an excellent resource that skeptics would benefit from greatly, whether they agree with the ultimate conclusions or not.